I have a small shop 20' x 20' where pretty much all machinery is ready layout. The only machinery to come will be a Hammer A3-31, probably next summer. I'm still in need of several carts & benches but room is a premium unless I expand my floor surface. I have been brainstorming about a multi purpose rolling cart and I would like your input on the subject. The base cart will be 36" x 60", made of 18mm BB. It will serve first as a outfeed table for the hybrid table saw. It will also serve as a sanding and assembly table. And more. I want the cart to hold the VAC SYS system like Jericho cart . In addition the top will accept an interchangeable custom MFT top to be used with the TS55. Ideally the MFT top should be stored on the side opposite to the VAC pump or else. Feel free to feed me with your thought & ideas. Check out the Felder FAT 300 or 500. It doesn't ship with a top, so you can fabricate and customize the hole pattern in whatever material you prefer. It can roll around and height adjust for outfeed/sanding/assembly. You didn't specify a budget, so I'll forewarn it's not cheap, but is quite versatile. The biggest downside is the inability to store material below the table. This might be a deal breaker for a small shop lacking storage space. Mario ... sounds similar to my situation .. I was looking at the A3-31 earlier in the year and ended up getting the FAT300 lifting table. It WAS VERY HARD for me to pay the price for the FAT300, but I have to say, I don't regret it at all. I haven't purchased the A3 yet, but saving space for it also. I plan on starting to build out the lifting table as my main shop cart/track saw/assembly station in the next couple weeks and have been toying with ideas and looking around the internet. Thinking of a modular system so I can adapt different worktops, and having a telescoping arms for work support and cutting down sheet goods. Also a platform at one end for my CT36. I'll post photos as I move along. Good luck with yours. I agree that the FAT 300 is a viable option, last month I requested a quote from Felder Canada, The FAT 300 quote was 2,700$. Well this is only a mobile base and no where to store anything. I just happened upon this one and although it does not have some of the things that you want it may serve as decent inspiration??? The Marcon Easy Lift Assembly table might be of interest. I saw it demonstrated at IWF in Atlanta in August. Very impressive, it provides electrical and air outlets, as well as pneumatic clamping. I spoke with Conrad for a few minutes, he is very passionate about his product! Seemed to be very well built, aimed at the furniture industry rather than an adaptation from metal fabrication. Any idea what the price is for this lift? I checked into these last year, after seeing them at the IWF in Vegas. Very well built and very pricey $$$. From memory, I believe they started at around $3 grand. I even had one of Conrads assistants take a look at the Felder FAT300 to see if they could build a similar lift. After some back and forth, I realized it was more economical to buy the FAT300, which was easier on the wallet for me and has worked out great. If you are looking for storage below, a lifting table, integrated vacuum clamping, and have zero regard for budget, you may want to take a look at the Barth VakuuCar as well. It's at least nice inspiration. I seem to remember around $4000 when you added wheels. Not cheap at all, but if it prevents ONE lost time injury it will have paid for itself. If it saved one project from getting dropped, saves a few hours per year.... YMMV of course. are these substantially better than motorcycle lifts? When ever I see these they always look like motorcycle lifts. I've seen quite a few people use second-hand hospital beds (or more accurately, the hospital bed frame) as the undercarriage for large scale MFT layouts. In the UK, you can pick them up relatively cheaply on eBay. in their clearance area for $285 --- rated to old 385 lbs. Also space constrained Mario and also looking to make a mobile Vac Sys cart. I didn't know I needed something called a "Vakuucar" in my life until now. If you don't absolutely need the space under the cart, I'd suggest the 500V instead. With the optional cam locks and feet, it's almost on par with a roubo for stability. It also offers a wider range of height adjustment. 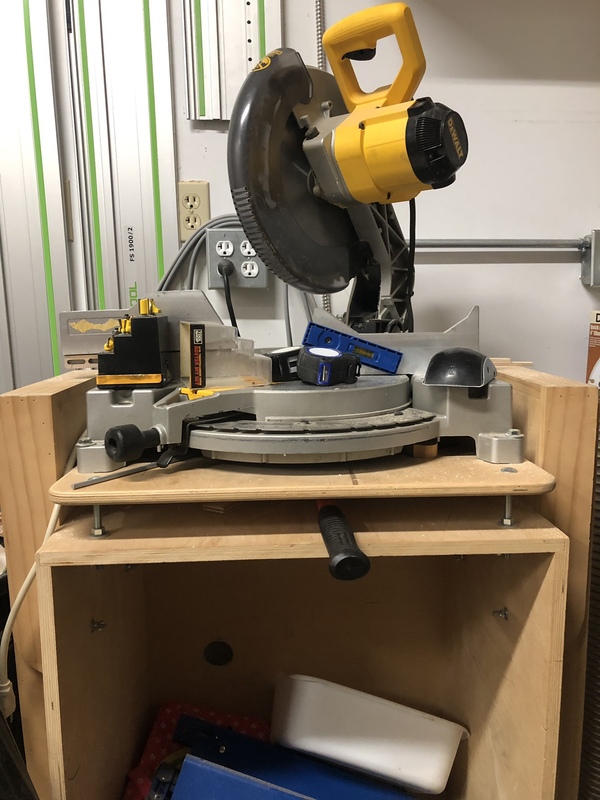 If your seriously considering the Festool pods and building a cart, at least evaluate the Barth pod unit (Vakuusyst) which integrates into an existing workbench. It offers rock solid construction, drops below the table when not in use, and has more adjustment flexibility (especially if you add extension tubes). The Marcon Easy Lift Table is absolutely substantially better than a motorcycle lift, kinda like the TS55 is substantially better than a PC circular saw. The operation is very smooth, it includes onboard electric and air outlets as well as a pneumatic clamp. The optional wheel assembly is also pneumatically operated. As I recall there are at least two sizes of the table available; seems like a 3x5 and a 4x8. After reading a ton of FOG posts I finally start with the cart project. and here after the cuts. Used the Kapex to have all the strips the same length on both axis. I am very happy with the result. I will add a frame 18mm strip around the grid to close it. On that picture you can see more closely how snug are the joints. They seems to be not flush but it's because the ply used to sit the grid is not leveled yet. That's the next part I have to work on before glue up. Now on the assembly? My plan is to put together the frame and then square it on a flat surface. Once it's perfectly flat and square add the grids. The grid will be sandwiched between two BB ply, not sure yet if it's going to be 12mm, 15mm or 18mm. Any advice and do I need to glue up the grid strips to keep from warping? That surface will be my table saw outfeed table and assembly table. Plan A: Make a custom MFT holes pattern to fit between the grid. The grid is 200mm (~7 3/4") square. I have the torsion box done. I used 12mm BB ply on both sides. To adjust from the top. I was also thinking about a threaded rod and knobs mechanism. You could just use a hacksaw and cut a slit in the top of those bolts for adjustment ease with a screwdriver. Or get separate feet with long rods to give you a knob closer to the top of the table. My concern there might be removing the flush sides that are great if you have T-slot around the perimeter. Check with McMaster.com for possible feet. Not sure if they ship to Canada or not. You could fashion your own out of some blocks of wood, T-nuts and feet from McMaster, Home Depot, or similar. Curious where you found that T-track. I really like the 90 degree clamping options it offers. You gave me a idea. grrrrrr, I forgot about taking a pict last night. Does that T-track from LV work with Festool clamps? It looks to be too large in the photos on their website. today . This is exactly what I was looking for, they support 385lb each . 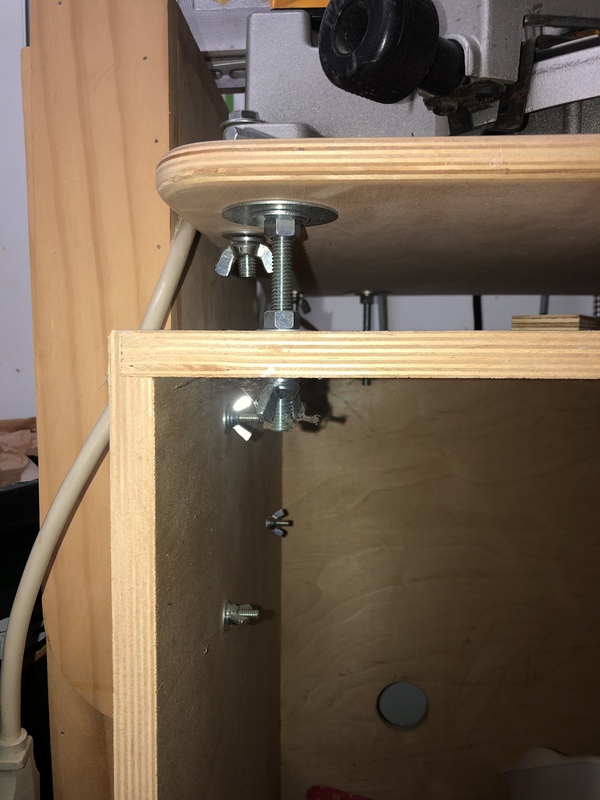 They will be fixed on the cabinet part and a reses hole will be bored from under the torsion box top, to keep the top aligned with the cabinet. I will also be able to sit a dedicated MFT top on it. Those levelers have a ~5/8 travel. Just be aware that the thread pitch on these is pretty coarse. Depending on how precise your level is and whether it matters you might find it difficult to turn one of these little enough. @Micheal Kellough Thanks for the heads up, I totally agree with you. The 5/8 travel works on only 5 full turns. Is it enough? perhaps on a large surface it is. Do you have any experience with those? @Mario Turcot not sure what all you want out of these things. Overall height adjustment can be increased with shims but earlier you said you wanted “micro adjustment”. Technically, to get the 1/1000” adjustment that implies down here in the Imperial States of America (not sure how fine “micro” is in a metric realm) you’ll need to find a way to turn the screw in 1/100 revolution increments. But, even with a 1/2”-16 thread screw you have to measure out 1/50th turn increments. You probably don’t need that fine of adjustment. The little “10-32 nickel plated steel leveling pads” can support 700# each and have 2” of thread for $5 a piece. You’d need to make a mounting plate from 1/4” steel. With a screw that small you’d need to protect it from lateral force but with a long enough wrench you could easily subdivide a revolution into .0001 increments. My apologize, I should have express myself a bit better. By micro adjustment I meant more in the 1/16 increment. There is many hydraulic/air compressed system I could have look at but those aren't accurate, unless you put the money on the table. I understand that it's hard to figure out what I want without having a concise idea of the table and it's components. My fault, only skimmed the thread. Sounds like the floor is the problem. If it isn’t too late you might use adjustable height locking casters. Those casters look pretty sweet. I already have the casters and like you said floor is the problem. What i am really concerned is to mitigate the torsion box distortion. I will give a try to what I found at LV and see if it keeps the surface flat. On another note, I will incorporate the Vac-Sys into the table. The Pedal will be in the front center fixed into a little cove like on that thread and the pump will be on a shelf close to the top. Not sure yet about the position. In the event that I want occasionally to move it out of the cart can I use stander air pressure quick connect? The bases have a quick connect on the body but the pedal and pump are fixed. First the torsion box alone will be around 80lb. It's made of 1 sheet of 15mm, 2 sheets of 12mm and 1 sheet of 18mm. In addition I have 2 t-tracks on the long side in the front. The T-tracks are for any clamping needs but mostly to hold and position the vac-sys bases. On the bottom side of the torsion box I bore 6mm inset on each corners (possibly 2 more in the center). The insets are to keep the torsion box in place where the "levelers" will protrude. I actually have that part figured out, it will not be a micro-adjustment but at least some way to have the torsion box somehow flat. I'm now at the base where I will have storage on each sides. Once I have the base constructed it will be easier to get a good picture of table. I came to this late and see you have the leveling figured out, but I would recommend bolts and nuts to level the table. I used that method to level a miter saw on a stand I built a decade ago. Works well. The above picture shows the frame where the "levelers" (6) will be installed. That from will be on the top of the rolling cabinets. A similar frame will have the wheels on it and will support the whole table. The above picture shows how the "levelers" will look. The Torsion box and the MFT top will sit directly on the "levelers". I Hope this help to figure out what I want to achieve. Only the track on the edge is installed & taking measurement for the second track. I was planning to use poplar, but poplar is a pretty soft wood. Any suggestion that will not break the bank? This will round up the top, next is the base. What is available in your area for a reasonable price? My preference would be hard maple and my second choice would probably be soft maple. Thanks for the suggestion. I only need 20' so maple should fit in my budget. For future reference, do you think I can trust that chart. Not all wood are listed but does that gives me a good representation of NA wood hardness? Thanks for sharing the Fisher's clip. His 180* swing design is unique and better than the usual one. I also found his video easy to follow (good pace of delivery), with no distracting or annoying music throughout. Oh and even better. 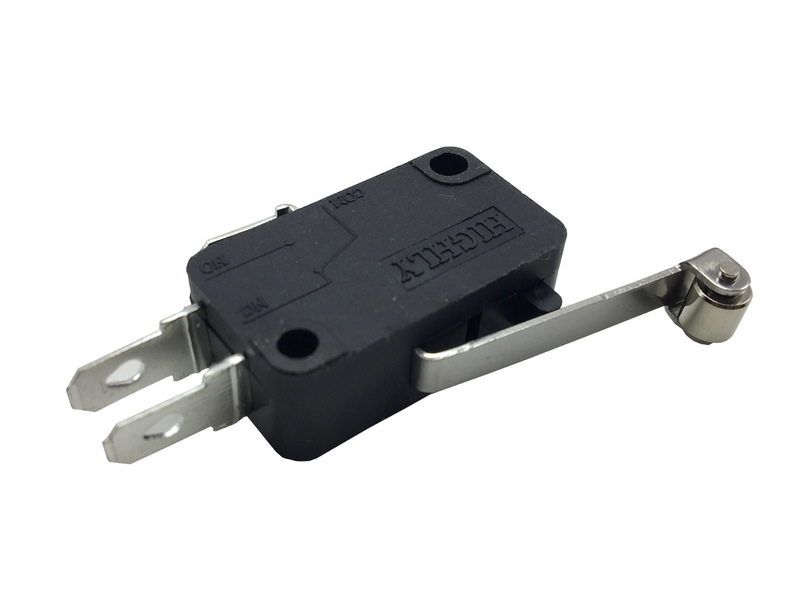 An electro magnetic switch that will control both tools at the same time prioritizing the one on top. Yeah that's how I will make it Now I only have to brainstorm a way to hook up dust collection. I forgot to mention that he is good with keeping his talking to the subject matter with little to no unnecessary explanations (I call it the Norm Abram style), and hence his video length is well managed. I went to his youtube channel, and found his project videos are 15 minutes +-, others mostly 5 to 10 minutes. I'll scan them out to see if anything is worth my full viewing. Yes he's very detailed...but was only meaning for you to check out his table levelers....but appears you have the issue solved nicely. I shop around for hard maple for the edges and it was $200 from home depot Going to pick up some at my prefered lumber yard this morning. have sharp edges they are not kidding! The two front cabinets. Systainers are accessible from the sides. Front view, the center part will have a cabinet to hold the vac-sys pump and pedal. The top base, this is where the levelers will be affixed. That base will support the torsion box top and MFT style top. I will make two cabinets similar to the systainer ones to hold the mini systainers, that will be on the back side. Between the two mini systainer cabinets I will have two 100mm drawers for glue etc.. and ten 40mm drawers for hardware. I still need to figure out how I will setup the vac-sys tubing. The vac-sys bases are on tracks so the tubing have to be flexible enough to accommodate each side of the table top. I will have vertical drawer on each side in the middle. Question: Do you still have any room left for woodworking after all these shop builds? A long time friend came to visit last weekend and his first impression of the shop was "You need a bigger place ASAP"
Now...aiming to get a bigger shop is THE reason why you're building all these (and buying more machines)! Some progress and the major mistake. Front view of the table. The central cube is to fit the VAC-SYS pump and some storages. The grey tracks are holding the VAC-SYS bases. Back view of the table. Again the central cube is for 10 thin drawers for storages. That side goes against the table saw when using as outfeed table. Side view of the table. Storage for standard systainers and mini systainers on each side. Now the mistake. The top end up being 16mm too high because I add another 18mm BB-ply on the top for the tracks. I have two options, replace the 5" wheels with 4" or remove the top base section(see picture below), that section hold all the cubes together. However all cubes are screwed together. Removing that section will not affect the base much. Replacing the wheels is about 20 minutes + I already have 4" wheels. But I don't have access to the top of the bolts. Removing the top section is about 5 minutes.